How come it took so long? Firstly, I am ill-disciplined. One week I can be very enthusiastic and do preparations way in advance for the upcoming week’s activities while another week, there are barely any activities to do because my mind was simply flooded with work. Work is definitely of no excuses but.. … ok.. no buts!!! The sandpaper number cards were bought from Little Muslim Readers while those heeeyuge poms-poms were from my all-time favorite store- DAISO. The last time Umar met poms-poms were perhaps a year ago when I was still doing #FuntabulousFridays. I used a sticky paper for this. 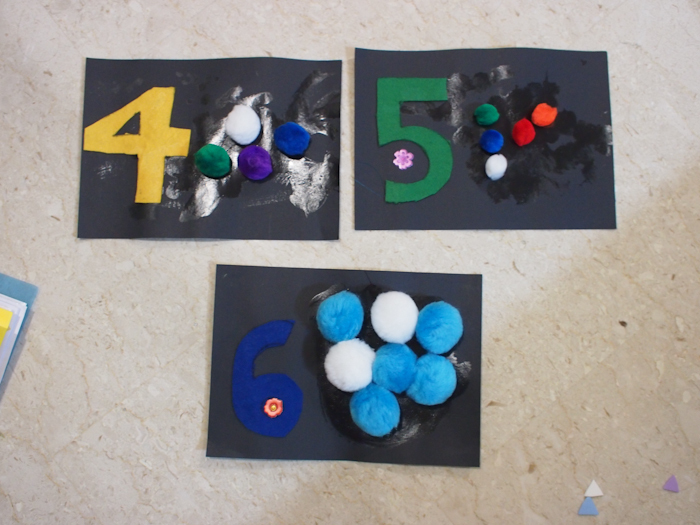 The first time Umar saw this and realized the sticky texture of the paper as well as the fluffy and ticklish texture of the poms poms, he literally took a few steps back. So I started showing him that he can pull the poms-poms off the sticky paper and throw it around like a ball. I even threw it at him, playfully of course. 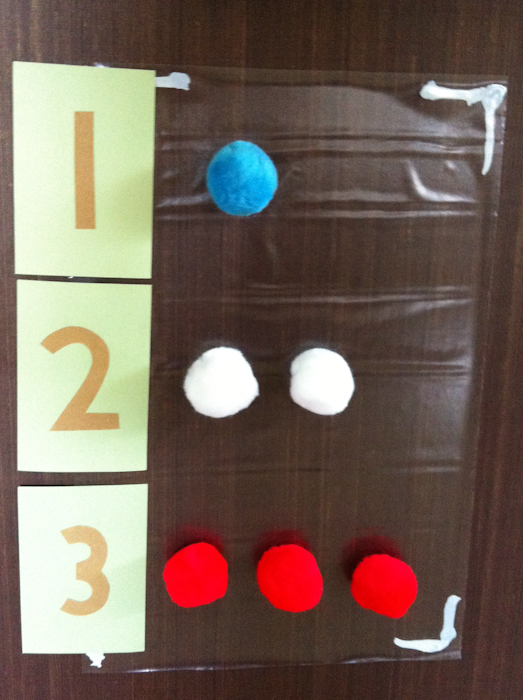 Only when I relate it to a ball, he was more willing to play around at the sticky board. 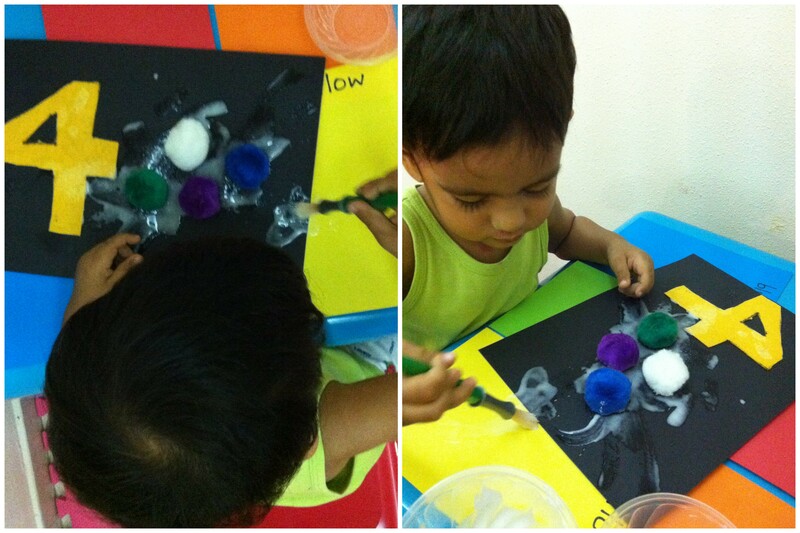 During this week, all of our activities involves glue. It was glue-with-anything week. Prior to this week, I was quite anxious because of his history towards paint. He dislikes paint and he seems icky about it. I revisited it anyway just so to see if he still have adverse reactions towards it. Luckily, he didn’t. In fact, he goes on and on with the glue and after that the poms-poms. I was really glad too that poms-poms are one of the things he likes playing with right now. Thanks to the husband, while looking at his 4, 5 and 6 artwork, he thought it will be a better idea if I infused something he really enjoys most – BALLS. Of course, I jumped to the idea the weeks that followed because I do have a tub of foam stickers that came in various types of balls – baseball, football, tennis ball, rugby – you name it! 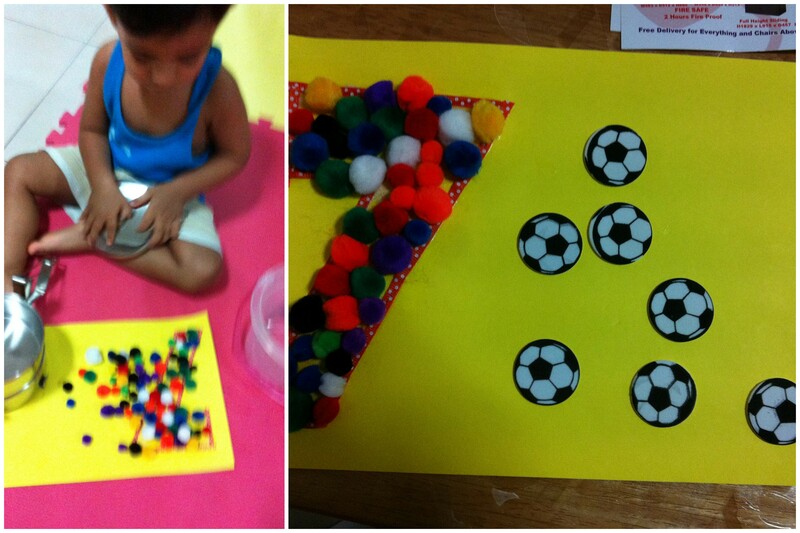 Right after number 7 activity, I had a lot of extra little poms-poms left and he decided to play with it. I quickly found some expired pasta, placed everything in a pail and did a sorting activity. That gave me time to store other craft materials and clean up any mess. Ok anyway, we tried colored ice-cubes using food coloring. He enjoyed that activity so much he sucked on the ice-cubes. #FuntabulousFridays. 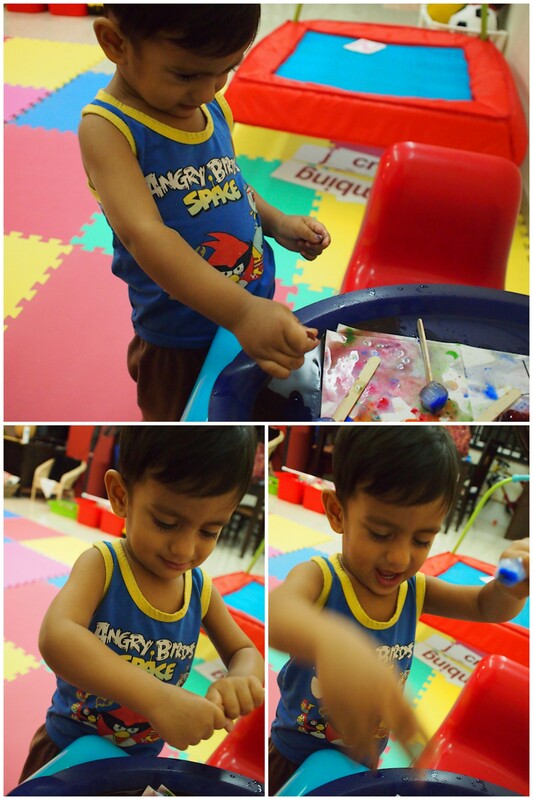 But when it came to ice-paint lollies, he was not THAT interested. He was done in 5 minutes flat because he was icky with the paint that was oozing from the frozen paint cubes. This was him barely 18 months and was introduced with iced-paint lollies. When I present him with the tray, I was anxious (yes, I get anxious easily) to see his reactions. 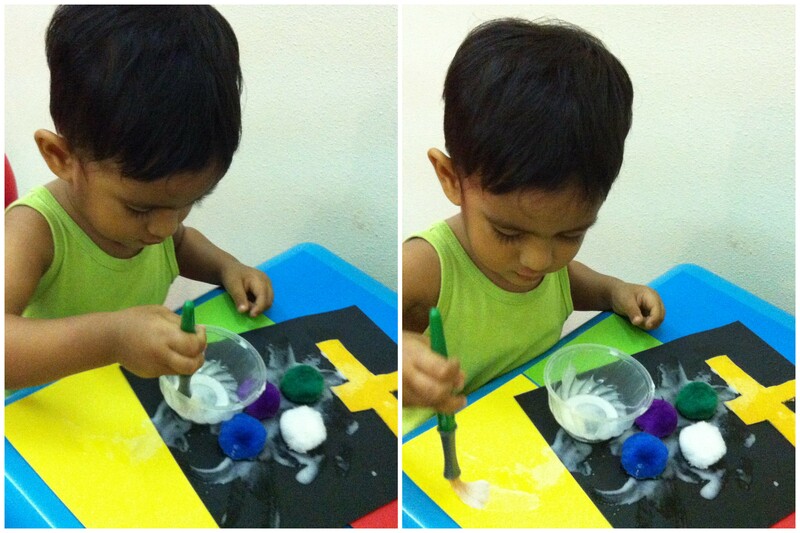 To my surprise, he took the iced-paint lollies very positively and spent close to an hour with this activity. That explains the MANY photos that followed after these. 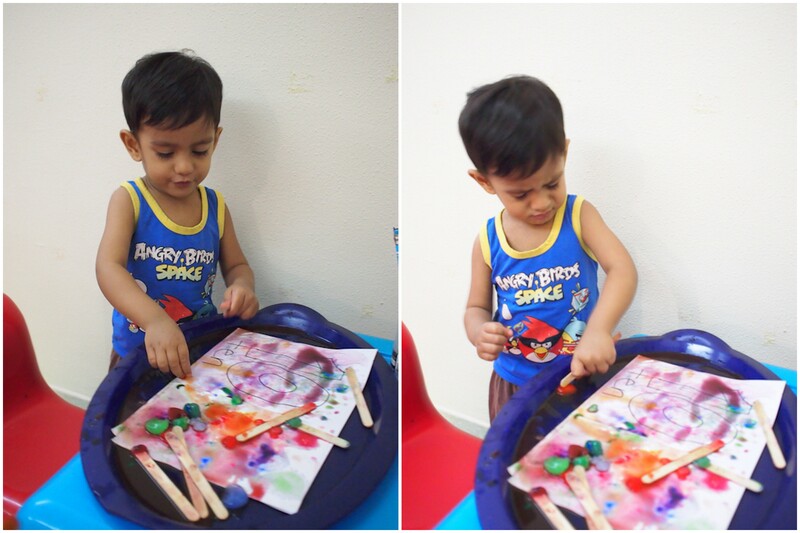 Not only he found it interesting to paint with but he also found other play activities for himself which I felt, it was a good time invested with minimal resources. 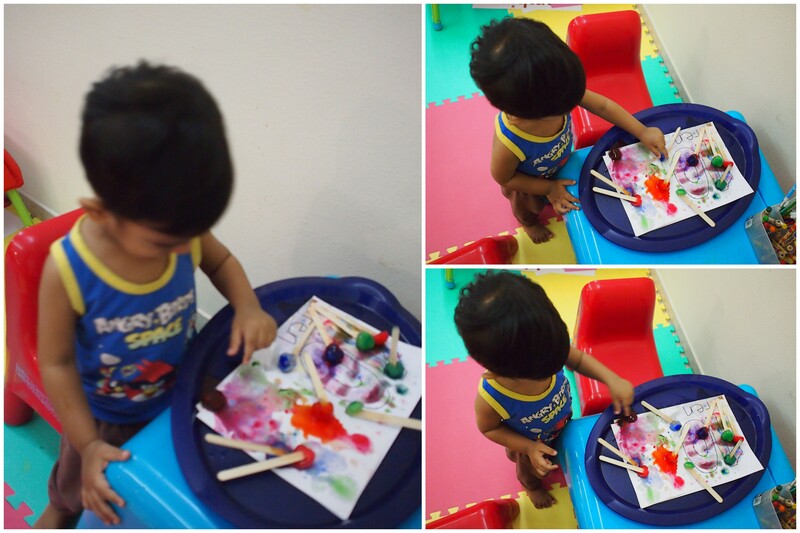 Then, he started squeezing the ice and trying to pull the ice apart from the ice-cream sticks and throwing it back to the tray to make music. 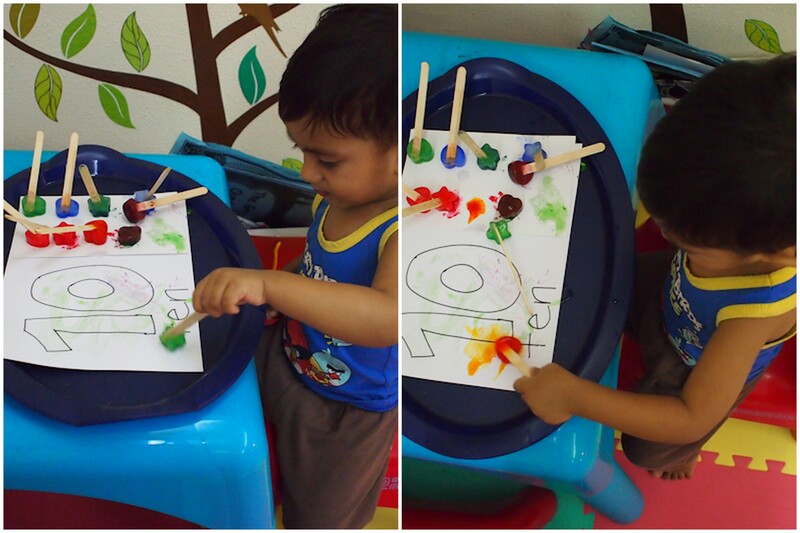 He also started to attempt to cut the iced-paint with his ice-cream sticks. Even after many failed attempts, he still continues to do it. 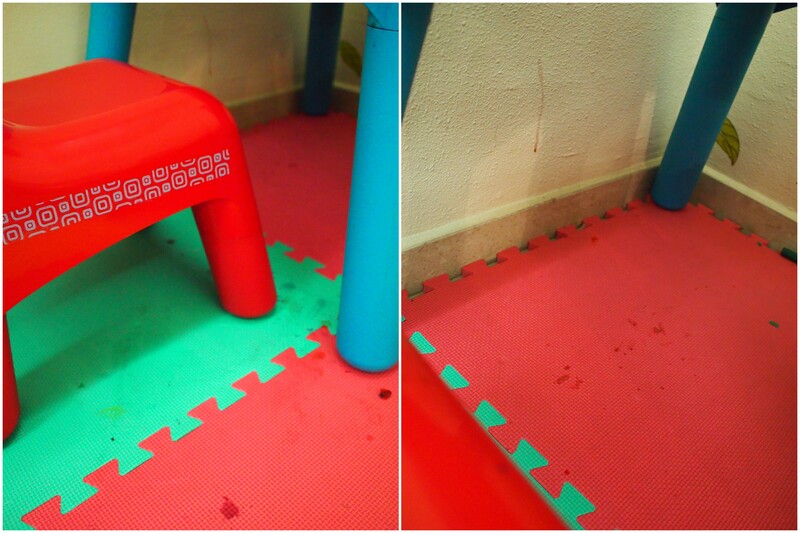 Of course, the iced-paint lollies started to splutter all over the place. 1. It’s ice!! Water. What is so hard to clean water. 2. 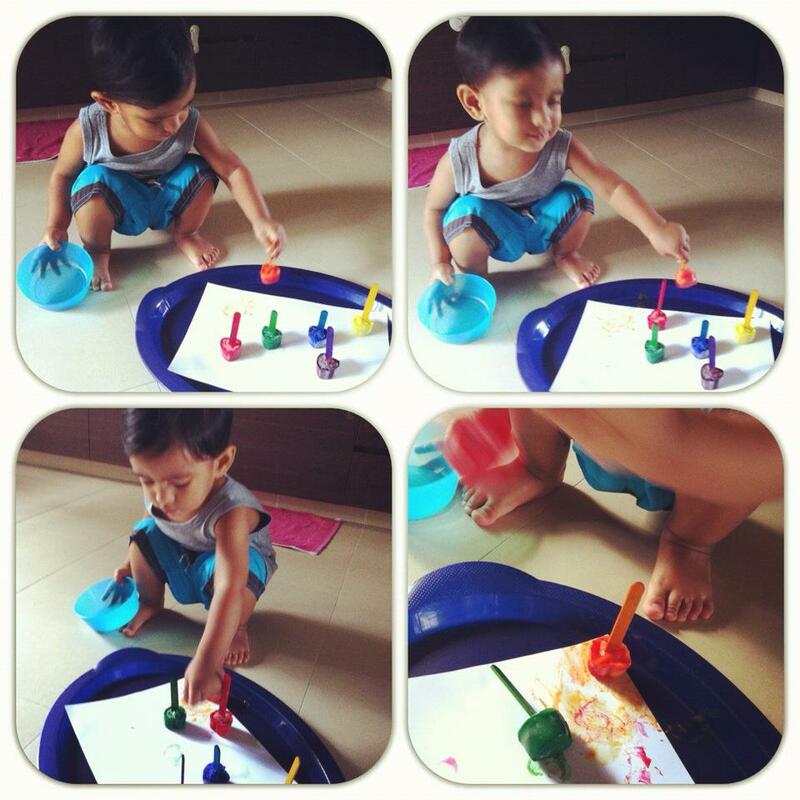 Water is mixed with Crayola Washable Finger Paint. For once, (ok many times) I was a ‘cool cat’. All I needed was a clean wet cloth to wipe it off. It was a biiiiiiit hard to wipe off the dirt off the wall because my wall has those tiny stones on it making it uneven. Thus, it was harder to wipe with just a swipe. 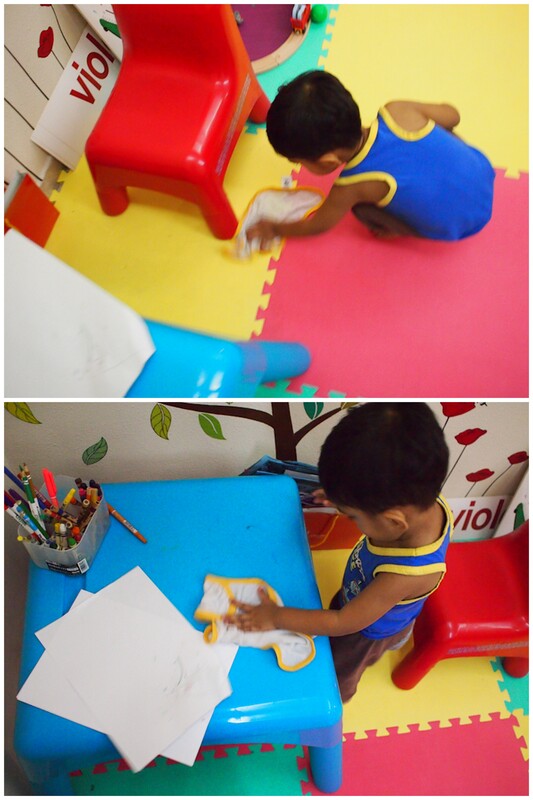 Of course, him, seeing me with a WET (spells: water) cloth, he insisted to have his own wet cloth. I cannot help but to offer him a wet cloth too so cleaning did not feel too alone.